Jennifer McGurk, RDN, CDN, CDE, CEDRD-S is a Registered Dietitian Nutritionist whose mission is to help people heal from diets, and find peace and balance with their food choices. As a Certified Eating Disorders Registered Dietitian, Jennifer combines her expertise in medical nutrition therapy, psychology, and physiology to help clients understand their eating behaviors, and gain the insight needed to make positive changes for their health. She is an expert in the field of eating disorders and also supervises other Registered Dietitians as an iaedp approved supervisor. She is involved with the International Federation of Eating Disorder Dietitians, the National Eating Disorders Association, and the International Association of Eating Disorder Professionals (iaedp). She is the Co-Social Media Chair for the New York City Chapter of iaedp. Jennifer has created the business, Pursuing Private Practice, along with authoring a book series of the same name, to help other healthcare professionals reach their goal of owning their own business. Pursuing Private Practice: 10 Steps to Start Your Own Business was released in January 2016, and Pursuing Private Practice: 10 Steps to Grow Your Own Business was released in April 2016. The Pursuing Private Practice Masterclass Ecourse was released in May 2017 and in 2019 Jennifer released the 2.0 version, Pursuing Private Practice for Intuitive Eating to help practitioners successfully grow a private practice that specializes in Intuitive Eating. 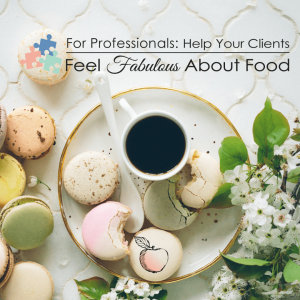 She also developed an Intuitive Eating course for clients, Feel Fabulous About Food and has a version of this program, For Professionals: Help Your Clients Feel Fabulous About Food which helps dietitians, therapists and coaches build a weight inclusive private practice by learning nutrition counseling strategies about intuitive eating and eating disorder recovery. with Intuitive Eating training and skills. Having completed her undergraduate training at Pennsylvania State University in Nutritional Sciences, she continued to Johns Hopkins Bayview Medical Center in Baltimore, MD, to complete her dietetic internship. She received her Certified Diabetes Educator credential in 2009 and her Certified Eating Disorders Registered Dietitian credential in 2014. Jennifer has professional affiliations with the Academy of Nutrition and Dietetics, Nutrition Entrepreneurs dietetic practice group, and the Behavioral Health Nutrition dietetic practice group. Jennifer is a frequent guest in the media, often talking about positive nutrition, body image, healing from dieting, and educating others about eating disorders. She also loves to talk about all topics related to private practice! She has given presentations at conferences and workshops to audiences from 10 to as many as 1,000 people, and has been featured in news articles and on podcasts. For Jennifer, each presentation is an opportunity to share with her audience her positive message about food. She loves being involved in her professional community and takes great pride in helping other dietitians achieve their goals and have an amazing career!